Call A to Z Entertainment, Inc. today for free information about how to hire or book Christian rock music singers, Sent by Ravens. We are your best booking agent and top talent agency for hiring live Christian rock band and musicians, Sent by Ravens! We book or help you hire any live professional entertainment you want, to include – Christian musicians and Christian rock singers and live bands. We also help you plan and produce your show, so call us today at 888-655-4575. In scripture, the Biblical prophet Elijah was fed by ravens in the wilderness. God sent these unclean, often frowned-upon birds to do His work. It was with this in mind that South Carolina’s, Sent By Ravens chose their name. “It parallels with how we’re all sinful people, but we can still carry God’s word to people,” explains charismatic vocalist Zach Riner. And what a powerful medium they have at their disposal: high-energy rock and roll with punk passion and melodic pop skill, all from very humble beginnings. There are flashes of “heaviness” throughout, providing driving power, but Sent By Ravens overall sound is characterized by incredibly joyous and intelligent pop n’ roll. Just a couple of years ago, guitarist Andy O’Neal and bass player Jamie Windham used a much more modern technological means than ravens — namely, the Internet — to contact Zach about singing for their band. He was singing for another band in Georgia, but after some thought and some prayer, he decided to make the move. They invited Dane Anderson to move as well — from Hawaii, no less — after seeing a video of him playing an Underoath song on YouTube. “We sent him a message and he asked us if we needed a second guitar player,” his buddy, JJ [Leonard] Riner recalls. By the fall of 2008, Sent By Ravens was together as the unit they are now. Sent By Ravens exceptionally memorable, deliciously catchy and overall uplifting rock n’ roll brings to mind the best and brightest moments of bands like Finch, Blindside, and Emery. Fitting then, that the Emery’s Matt Carter helped craft the band’s debut album with producer Aaron Sprinkle (Underoath, The Almost). In a short amount of time, Sent By Ravens has accomplished a great deal. They were able to headline the House Of Blues in Myrtle Beach before even signing to a label. They’ve opened for and toured with bands as diverse as Every Time I Die, Family Force 5, Staind, Showbread and many more. 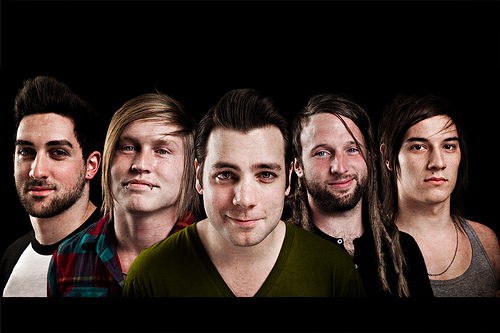 Their self-released EP, The Effect of Fashion and Prayer, helped catch the attention of Tooth & Nail Records, who quickly signed them to a worldwide deal. We can help you book or hire any Christian musicians and any live Christian rock bands. We’re your best booking agency and agent for hiring Christian rock singers, Sent by Ravens, so call 888-655-4575 today and we’ll be happy to help you. A to Z Entertainment, Inc. is not the exclusive booking agency for any live entertainers on this site.